My department has inherited a Clariion AX4-5F disk processor enclosure (product number 100-562-104), which is carrying inside of it two fibre-channel Storage Processors (each one them with two fibre-channel ports), and also comes with 12 SAS 3.5" 146 GB @15Krpm disks. It comes from another department which has been shut down, and we do not have the login credentials to this storage system. Also, the data inside of this storage system is of no value to our department. So I would like to put this storage system to use as a test storage system for the internal projects in our department, but when I try to connect with a browser to the Navisphere Express in either storage processor A or B, a login screen appears and we cannot get access because the credentials needed are unknown to us. Also, when I run the "EMC Unisphere Storage System Initialization Wizard", it detects the storage system but says it is already initialized and cannot proceed further. And finally, the support contract the old department had with EMC has run out, so we are out of support with them. 1. Is it possible to un-initialize this storage system, in a self-service fashion (i.e., without involvement from EMC support services)? 2. 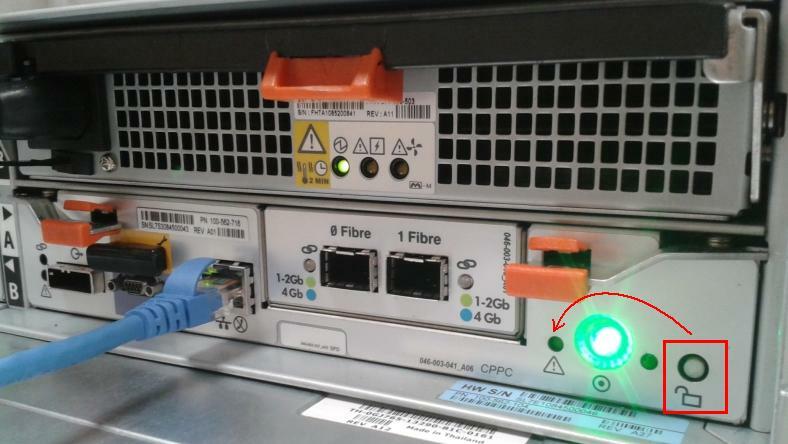 How can I reset the login credentials in order to gain access to this storage system using the already working Navisphere Express which are running on both Storage Processors? 3. Should I just give up, yank out the SAS hard disks, and send this storage system to the recycler company? Re: Clariion AX4-5F security reset? Or how to un-initialize it? If you can't access, let me know and I'll attach. If you can then access the navisphere interface, you'll be able to delete all the LUNs, destroy the RAID GROUPS etc, and basically reset the array to a blank canvass. It's be a handy bit of kit to have as a sandbox or dev piece. Hello, Brett@S. Thanks a lot for your reply. I cannot access the page you linked, when I try with my EMC username I get back de error message "Access denied. Page you are trying to access is not allowed .. Sorry for inconvenience." Could you please attach that information, or somehow send it to me, please? Re: Re: Clariion AX4-5F security reset? Or how to un-initialize it? Issue Forgot password for Navisphere 6 domain and cannot log on. Need to reset security because password was forgotten. Establish a PPP connection to one of the storage processors (SPs). Enter a user name and in the New Password Verification text box, type in the password again. Note: You may need to restart Management Server on both SPs. Log in to domain using the newly-set username and password. Then perform all other steps as described. Note: If the procedure does not work, connect to the master SP and rerun Steps 1 to 7. If the AX4-5 storage system is running Navisphere Express, this solution does not apply. Unfortunately, both SP in this Disk Processor Enclosure (Clariion AX4-5F) are running Navisphere Express. And the article you pasted says "If the AX4-5 storage system is running Navisphere Express, this solution does not apply". Is there by any chance some other way to reset the login credentials for this storage system? On an SP, press the white security button to the far right of the power button to put the SP in a special reset state (Figure 1). The amber SP fault light turns on. You log in to the storage system with a valid username and password. You create a new user account. You modify an existing user account. The 15 minutes is up. Open an Internet browser, such as Internet Explorer, Netscape, or Mozilla, on the management host. Enter the IP address of an SP in the storage system. This address is the one that you assigned when you initialized the storage system. Either log in to Navisphere Express as you normally would or without a username and password. In the navigation pane, under System, click Settings. In the System Settings pane, select User Management. Modify or create user accounts; then exit Navisphere Express. For detailed information on modifying or creating user accounts, refer to the Navisphere Express online help. Test the new credentials by restarting Navisphere Express and logging in to it with the new username and password. Yes, both Storage Processors (A and B) in this disk processor enclosure have a small white button on their bottom right corner, next to the printed image of an open padlock. When I press either of them, the led light next to the warning symbol blinks once in orange, it does not stay in orange. I wait the prescribed two minutes and then I try to access the Navishpese Express in the storage processor, but still it keeps asking for login credentials (i.e, the Nevisphere Express system does not allow me to by-pass the login step). Perhaps the "open padlock" button has to be pressed in some special way? Please, could anyone confirm whether this storage system (Clariion AX4-5F) can take standard 3.5" SAS disks, or does it only take disks flashed with a proprietary EMC firmware? Although it will take standard drives it is not supported by EMC. I see you are affiliated with EMC. Do you per chance know of a working procedure to reset the administrator password in the Storage Processors running Navisphere Express 6 of a Clariion AX4-5F storage system?